Six years after the onset of the Great Recession, amid an uneven global economic recovery, people around the world remain wary about their economic prospects. A median of 46% across 44 countries surveyed in spring 2014 by the Pew Research Center expect their economy to improve. An equal proportion say conditions will remain the same (26%) or worsen (20%). 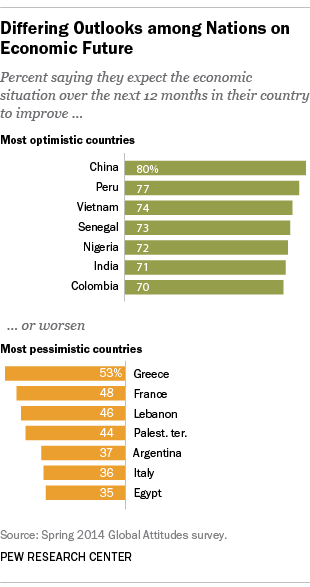 The public is upbeat in a handful of nations and particularly pessimistic in a number of others. These expectations are generally in line with economists’ predictions, but not always. The Optimists Club: The countries with the rosiest views of the next year are those with emerging or developing economies. Eight-in-ten Chinese (80%) expect their economy to get better over the next 12 months, as do roughly three-quarters of Peruvians (77%) and Vietnamese (74%). Seven-in-ten or more Senegalese (73%), Nigerians (72%), Indians (71%) and Colombians (70%) are similarly upbeat. Notably, economic forecasters at the International Monetary Fund (IMF) expect little improvement in most of these economies over the next year. The striking exceptions are India, where the IMF foresees the economy accelerating from 5.4% in 2014 to 6.4% in 2015, confirming public expectations, and China, where public optimism is at odds with an IMF prediction that the economy will actually slow slightly, from 7.4% in 2014 to 7.1% in 2015. The Pessimists Club: More than half of Greeks (53%) anticipate economic conditions worsening over the next 12 months, (another 26% expect the Greek economy to remain the same, which, in a nation where the economy shrank by -3.9% in 2013 is hardly a vote of confidence). In addition, 48% of the French expect their economy to deteriorate, as do 46% of Lebanese and 44% of Palestinians. Greek pessimists, however, may be pleasantly surprised: the IMF foresees the Greek economy improving from 0.6% growth in 2014 to 2.9% in 2015. Similarly, while less than half the Lebanese expect more hard times, the IMF forecasts Lebanon’s economy to accelerate from 1% growth in 2014 to 2.5% in 2015. The U.S. public falls somewhere between these two groups, with Americans equally divided on the future of their economy: 35% expect it to improve, 33% assume it will remain about the same and 30% foresee it worsening.